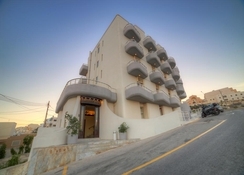 Facing the sea and offering great views, the 3-star Ambassador Hotel offers comfortable and elegant accommodation in Malta, a short distance from St. Paul’s Bay. The hotel’s spacious rooms are distributed in a modern building of seven floors. The complex features a large outdoor saltwater pool, a solarium and a terrace. In addition, it serves an extensive menu of local and international cuisine in a pleasant restaurant with capacity for 130 people. The bar has a cosy ambience and a large TV. The facilities of the Ambassador Hotel are completed with a games room, an area equipped with computers with internet access and two rooms for organising events and meetings. The restaurant and the Bistro Bar, where live shows are held, are located in the basement of the building. 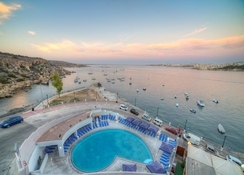 The Ambassador Hotel boasts of a beachfront location offering excellent views of the Xemxija Bay, a small cove famous for its relaxed atmosphere, wonderful landscapes and splendid sun. Good food in a great ambience is a vital part of the Maltese lifestyle, and a number of restaurants, trattorias and bars serve at a short distance from the hotel. A 5-minute drive from the hotel is St. Pauls Bay, a coastal town of humble origins that has become an immensely popular holiday destination. This area of ​​St. Pauls Bay is full of restaurants, cafes, wine bars, pubs, nightclubs and beach clubs, and also houses a movie theatre, a casino, the national aquarium and many more leisure options for all tastes. A little further, approximately 20 minutes by car or bus, Paceville displays a diversity of options in nightlife, and Popeye Village, the filming set for the Popeye film starring Robin Williams, is a must for families with children. The Malta International Airport is about 24km from the hotel. 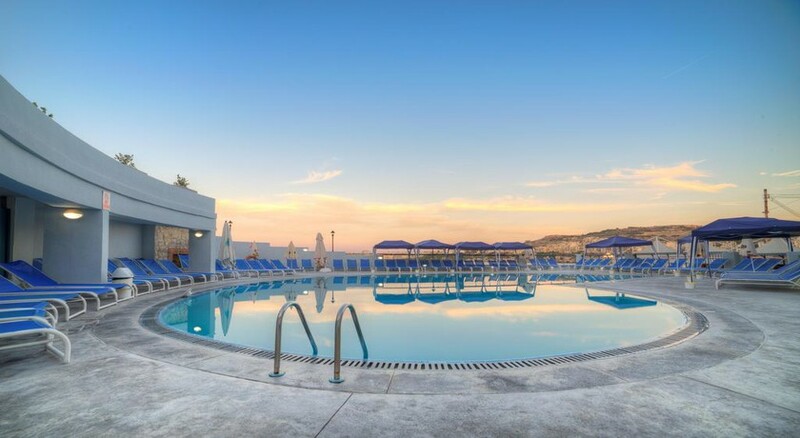 The 150 guestrooms at the Ambassador Hotel offer beautiful unobstructed sea views, sea views or views of the interior of the island. 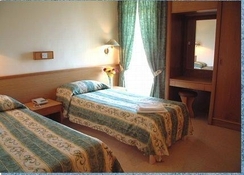 All rooms have private bathrooms with showers, are spacious and comfortable, and offer a balcony. Room amenities include air conditioning or fan and heating, as well as television with satellite channels. Upgraded rooms add in-room safes, coffee & tea making facilities and minibars. There are also apartments with a kitchenette. Ambassador Hotel's restaurant serves a varied buffet of Maltese and international cuisine, and breakfast is also served buffet style. Malta has a unique location in the heart of the Mediterranean, and is the largest of the three islands that make up the Maltese Archipelago. Facing the sea and with a 3-star category, the Ambassador Hotel offers modern and comfortable environments for holidaymakers and business travellers. Outside, guests can enjoy a large saltwater pool, a terrace and a solarium area. The reception staff is available 24 hours a day, provides access to a safe, provides tourist information and can organize excursions in the surrounding area.